RCS is also celebrating its 40th birthday at the event, which sees thousands of radio professionals from around the world gather for conferences and a large trade show. 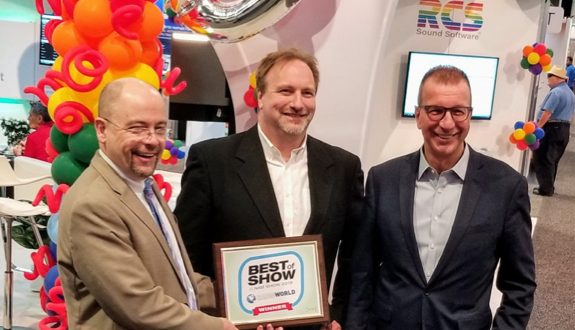 Philippe Generali, President/CEO of RCS commented: “We are honored to receive this prestigious award and very encouraged that some of our largest customers around the world are enthused by our new cloud-based offerings, including Zetta Disaster Recovery. Zetta Cloud is a Disaster Recovery system which continuously backs up a station database including audio and schedules, and then sends it to the Cloud to continue working in the case of a serious event that disables your radio studio. It allows users to stream directly from the cloud to a transmitter or another studio if the worst happens. Photo: Managing Director, Content, Paul McLane (left) Chip Jellison, CTO/EVP Technology & Development (center) and the President/CEO of RCS, Philippe Generali (right).